With the hustle and bustle of the holiday season, many of us probably find ourselves un-prepared when dinner time comes around. I have found that when I do the prep work for a weeks worth of meals all at once, it helps make dinner time a cinch, and all I have to do is throw together the ingredients. This saves us a lot of time, and money that would have been spent on a meal out. Here are a few tips and tricks to help get dinner on your table during these busy times. Plan you menu for the week- By listing at least 3-5 meals you would like to prepare and eat during the week, you can get all your grocery shopping done in one trip, and save time by not having to make those last minute trips to the grocery store. Take out the recipes for the meals you would like to prepare for the week. Break down the ingredients and make a shopping list. Shop all at once at the grocery store for all your items. Now it is time to do the prep work. Do all the chopping, dicing, slicing, browning, or cooking of any items that can be prepared in advance. This is nice, because I find that I use a lot of the same ingredients for many of my recipes: onions, garlic, etc. It is nice to only have to chop them once, only getting one knife dirty and one cutting board. 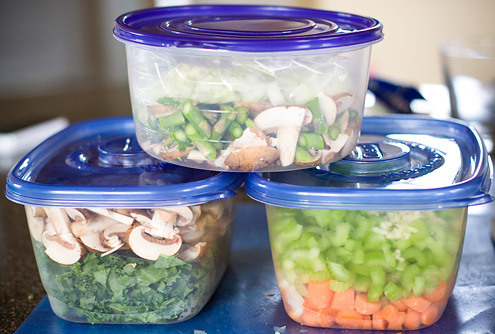 Place all of the ingredients for each recipe in a ziploc bag, or storage bin, so you can easily throw them together when it is the actual time to prepare the meal. You may need to use little baggies or separate containers if certain ingredients cook before others. Label the containers with the name of the meal that it will be used in and, place all the prepped ingredients in the fridge. When you are ready to cook your meal. Pull out all your prepped ingredients and throw it together. And, there you have it! Hopefully this will save you a lot of time, and head scratching wondering what is for dinner. Chicken Tomatillo Soup with Hominy- a favorite! thank you for these tips! they are super helpful- getting dinner on the table can be a battle especially this time of year and i dont even have kids yet!